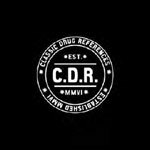 Various Artists - Classic Drug References 1 3x7"
Custom black box set with three 7-inch records and a zine. Limited to 500 worldwide! New and exclusive music from Danny Brown, Blu, KNX, Ras G, Dibiase, Quell Chris and more. Zine includes essays and articles from Dart Adams, Hux Murda and more, plus original photography from b+, ani213 and more. When I saw this box I didn't know what it was. It was a mysterious black box with no labeling on the outside, but once I read the description...!! I mean it is limited and the features are like a hip-hop pro bowl! I like the heavy bass and poppin drums on the track ''Sweeney Song''. Danny Brown rips of course as he understands life, woman and how to have a good time instead of staring at the ceiling depressed! Great hip hop! Please note: due to the weight and size of this box set there will be an extra shipping charge for most orders, depending on shipping address and the size and contents of the order. We will contact you for approval of any extra charges before shipping.